Have you ever sailed on a schooner on the ocean? In July 2015, only a couple months before my sixteenth birthday, I had the opportunity to do that. Even though the prospect scared me, the trip helped me realize some new things about myself and opened up my interest in sailing. On July 19, I stepped on the 61-foot classic wooden schooner Brilliant at Mystic Seaport in Mystic, CT.
Boarding the boat, I was a little uneasy about how I would be able to deal with the challenges of living on a boat for a week, but that feeling quickly faded away as we headed out on our journey. 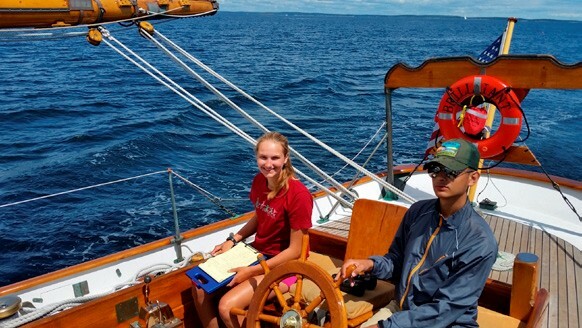 We immediately started working together, setting sails and coiling lines as we began our eight-day trip to Rockland, Maine. Every day became easier and more and more fun. We learned new things every minute we were on board and everyone improved their sailing skills, no matter how much we already knew. From learning new ways to coil lines to learning how to navigate, we were always learning something new. The boat’s home at Mystic Seaport was the location of my only previous serious sailing experience. I had almost no experience, except for a weeklong day program at the museum, sailing on small, 9-foot Dyer Dhows and 15-foot JY15s. The Dyer Dhows are used to teach the local community, as part of the Joseph Conrad Overnight Sailing Camp, and in a racing series. 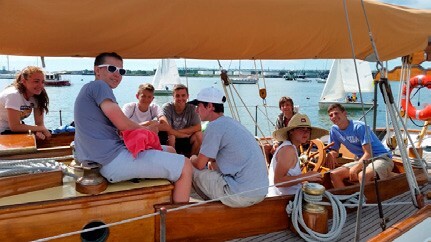 These boats were easy to handle and I managed them with one other person’s help, but a large schooner requires a crew. When my parents told me about Brilliant’s eight-day cruise, my first thoughts were clouded with apprehension but then I focused on the facts: I wouldn’t be all by myself; there would be a crew of other kids my age learning new things and working together. I knew I would meet new people, and just as I thought, I met some kids that had come all the way from Alaska to sail on Brilliant. This impressed me that they traveled so far to go on the trip. Other kids came from Connecticut and Massachusetts. I also knew I would experience a lot of new, different things, like not having a fresh water shower to use whenever I wanted, no technology to communicate with people at home, and working together in a group to get a task done, like setting and striking sails. We sailed through the waters of five different states and saw dozens of seals, different sea animals including a Mola Mola (sunfish), and got to see the beautiful sights of being surrounded by ocean and the different coastlines. From the sandy beaches in Connecticut to the rocky coasts of Maine, the changing shoreline as we sailed by was an interesting way to mark the distance we traveled. Tight quarters made it simple for us all to become friends and each day became easier to adjust to life on board. Although the schooner Brilliant is considered by many to be a large boat, her quarters made it obvious that you were sailing with eleven other people. We shared the tight spaces and got to know each other. Working next to one another and managing the limited living space and stowage was difficult, but it became easier throughout the trip. Everyone gave each other the space that was needed. It might be the condition of sailing or the fascination of sailing on a boat like Brilliant, but it’s an automatic feeling that you move with more dignity. The style on a sailboat is almost more refined and you find that you act more elegant and well behaved. Your manners are sharper and you willingly become part of a close-knit special community. I think this respectfulness comes from a need to be prepared in any situation and knowing that you need to take care of the boat and the other crew because you are depending on it taking you safely home. I was most nervous about missing home and my family and friends, but Captain Nicholas Alley, Mate Chris Jander, and Cook Keene Morrow made everyone feel as comfortable as we could be. Eating meals together made it feel more like home cooking, and setting and cleaning up the table for the other watch gave a certain responsibility on the boat. Sailing on Brilliant comes with a lot of honor and respect. 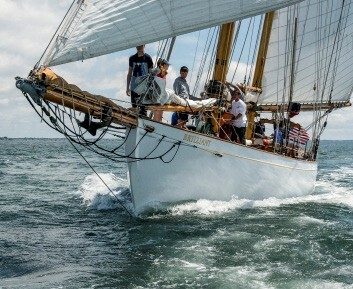 Brilliant was designed by Olin Stephens II and built in 1931 as an ocean racing yacht, and on her maiden voyage she crossed the Atlantic Ocean in a little over fifteen days. Mystic Seaport now uses Brilliant as an offshore classroom and she is a well-respected vessel known for providing many once-in-a-lifetime experiences for those who sail on her. While berthed in Portland, Brilliant was docked next to the newly built 141-foot schooner Columbia, a replica of the famous Gloucester fishing schooner of the 1920s. Our crew went to look at the boat and the Columbia crew asked where we were from. It was really an incredible feeling to say that we were the crew of such a famous boat while we were still in high school. The hourly night watch is to ensure that everything is going well on the boat while anchored at night. You are awakened by the person who was previously on watch, and you wake up the next person when it comes time. Things like taking bearings and making sure Brilliant’s tender Afterglow is still attached are commonly done on an anchor watch. Waking up during late hours of the night was not always enjoyable, but it was a responsibility that had to be taken care of. Late night watches were not exciting other than seeing a ton of gorgeous stars and enjoying the peace and quiet, but having a watch where you could see the sun rise was a different story. Watching a sunrise is already a beautiful thing, but watching it surrounded by perfectly still water and fog makes it a hundred times better. Not having access to a phone for a long period of time and being able to connect with people without technology was nice. Starting conversations with one another was a good way to become closer with the rest of the crew, and playing cards was a good way to pass the time. Meeting people from all over the country was new and exciting. Making new friends is great, and even better when you get to spend a week on such a beautiful boat doing something you love. It makes it a lot easier to get along with a new group of people when there is a common interest. 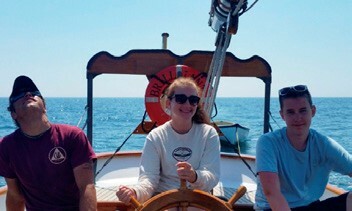 The ability to have sailed on a boat with such honor and respect is something that people my age don’t get to do, and I’m so happy that I’ve gotten to experience it at such a young age. I really hope that I get to sail on Brilliant again and I hope that sharing my experience makes people want to sail on Brilliant and enjoy a voyage similar to mine. Emily Bullard is a student at RCS High School in Ravena, NY. 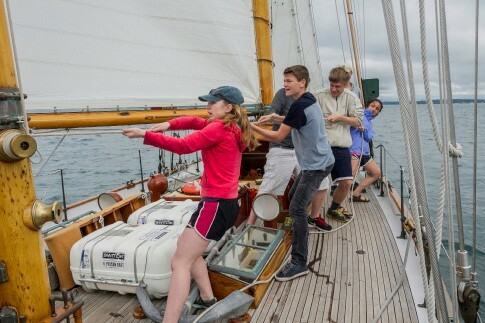 Editor’s note: Mystic Seaport’s Teen Sailing Program aboard Brilliant focuses on educating participants about sail handling and theory, teamwork, being a good shipmate, stewardship, navigation, and proper seamanship. Five-day, eight-day and ten-day programs are offered for ages 15-18 during the summer months. For more information and a link to Captain Alley’s Brilliant Blog, visit mysticseaport.org/learn/sailing/brilliant-programs/teens. Mal de Mer – Oh, My Aching Stomach!